Angelina is a pianist and musical composer graduated from the National Conservatory of Kazakhstan, her native country. She is also a specialist in the direction of symphonic and choral orchestras. After training in classical music, Angelina transferred to Italy to study electronic music at the Santa Cecilia Conservatory in Rome. Stefano is an Italian scientific astronomer and science disseminator. He studied Astronomy at the University of Bologna and Science Communication at the International School of Advanced Studies of Trieste. He conjugates both branches of its formation in the Astronomical and Planetary Museum of Rome. The vibrant Rome served as a catalyst for the passions of Angelina and Stefano to merge to create an original and unique project. They have called it Astroconcert. What exactly is the astroconcert? Astroconcert is a project that combines the immersive experience of electronic music with the exciting narrative of scientific dissemination. They both have produced six different concerts that explore different facets of astronomy: Aurora borealis, Cosmic Echoes, Stellar Vibrations, Voyager Chords, Infinite Destiny and finally Icy Rose 67P. I had the good fortune of going to the Icy Rose 67P show, and I still do not get over the surprise and excitement that I felt. 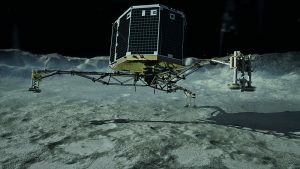 This astronomical concert is dedicated to the exploration of comets and the fascination that they have awakened since the dawn of humanity, in particular to the Rosetta mission. 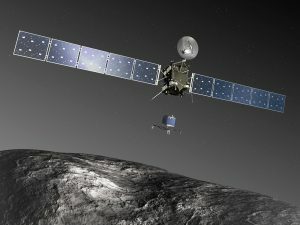 Rosetta was an ESA probe that between 2014 and 2015 orbited the 67P/Churyumov-Gerasimenko comet (aka 67P). 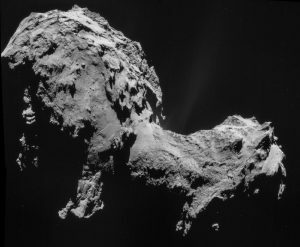 In addition to studying the comet from its orbit, Rosetta sent a lander called Philae to its surface. They both were used to know the composition of the comet and thus obtain clues about the Solar System formation. Just as the Rosetta Stone was key to Egyptian hieroglyphics understanding, and the obelisk in the city of Philae was key to complement the stone deciphering, the Rosetta probe and the Philae module were a priority task for space exploration. 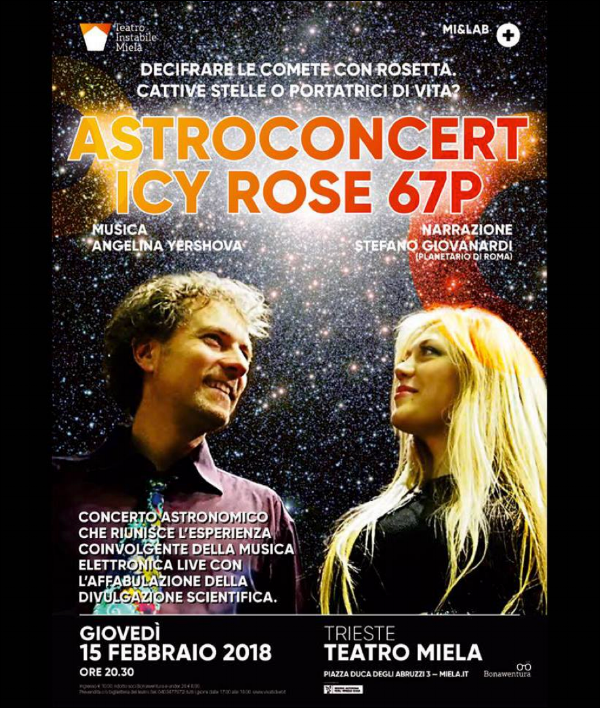 And the Icy Rose 67P show is a tribute from Astroconcert to this milestone. The Astroconcert shook the cosmic perspective I have on the stars. First, I went through the history and mythology that has surrounded comets. Also, I contemplated the metamorphosis of their cultural meaning and our way of looking at them. Moreover, I marveled at the idea of considering them carriers of life! It was a hypnotic experience! The Angelina’s surrounding electronic music with piano, theremin, and mixes, in addition to the images and animations in high definition on a giant screen, and finally the captivating scientific narrative of Stefano, took me to an interplanetary orbit without getting up from the chair. This fusion between art and science created a material that amazed me and moved me. In conclusion, Astroconcert is a unique and wonderful and original science communication format. So that you have some idea, it would be like watching an episode of Cosmos on a giant screen, musicalized and narrated live. It is a show that deserves to be more known and popularized, and why not, emulated by musicians and scientists from Latin America. The original version of this post is in Spanish on Revista Persea. To know more about me, please check it out a recent interview I've provided: Faces of Science.